Now my best friend who blogs on Helpful Daddy has some great recipes that he has made for his family and he has given me some great ideas. When I cook for the girls, I like it easy and with simple ingredients that I can find in any grocery store. I love the Kraft cooking magazines we get in the mail and they are free. Just go to Kraft Canada on the web and sign up. I also like other recipe sites but found two really good ideas that I tried last week and both turned out great. One is a vegetarian dish and the other a chicken dish. I am not the person who endorses vegetarian dishes but I do have an open mind and one meal without meat a week isn't such a bad idea. So here are the basic steps I took in making them and I will also add a few comments on what I will do next time I make these meals. 1. I took 4 boneless, skinless chicken breats out of a box we bought at M&M's. Very clean and no fat on the chicken. Cut into 1 inch cubes and toss in flour. 2. 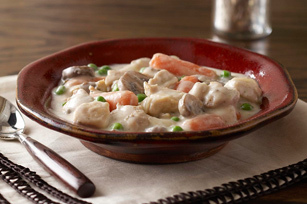 1 can of low sodium chicken broth, 1 package sliced mushrooms, 3-4 large carrots sliced and 1 medium onion sliced into the slow cooker and add the chicken. Place on high heat for 3-4 hours or 7-8 on low. 3. With 30 minutes left to cook or just before you want to eat place 1 cup of frozen peas into slow cooker and half of a 250g tub of herb and garlic cream cheese low fat. 4. Stir together and make sure cream cheese has worked its way into the broth and over all veggies and meat. 5. Serve after everything is hot. Now I found that potatoes would be nice in the stew and corn. You can always leave out the mushrooms and the low sodium and low fat was my choice but you could use regular chicken broth and cream cheese. Really you can add or subtract anything you want from this stew and make it your own. A friend at work that I showed my leftovers to suggest another great idea. Once the stew has finished, place into pie shell that has been baked and top with stuffing. Bake until stuffing crispy and serve. I might just try that next time. I would suggest using stove top, which is my favourite, and I like the low sodium one. The other recipe I tried is a vegetarian dish but very tasty. 1. Large eggplant peeled and sliced length ways or cut into round pieces. I did the round pieces and it work okay but a friend cut it length ways and said it was easier to roll. Mine looked like tacos!! 2. Place eggplant in oven at 350 for about 10 minutes to soften up so it will roll easier. 3. You will need a small container of ricotta cheese, 1 pkg mozzarella cheese shredded, 1/2 cup basil, 1/3 cup bread crumbs & 1/2 cup Parmesan cheese. 4. Place into bowl but save some mozzarella for topping the eggplant in the pan. Mix together. 5. Once eggplant has cooled, place mixture onto eggplant and roll. Place in 9X12 pan that has been sprayed or oil rubbed to prevent sticking. 6. Pour tomato sauce over eggplant and finish off with extra mozzarella cheese. Bake for 30-35 minutes at 350. Now I would have liked a bit more flavour and garlic and onion would have been nice to add. Very delicious however and generally good for you if you don't eat the cheese!!! Anyway, I found both to be very good and easy to make. Not too much complicity and tastes very good. Nicole enjoyed the country stew and I ate all the eggplant rollatini!